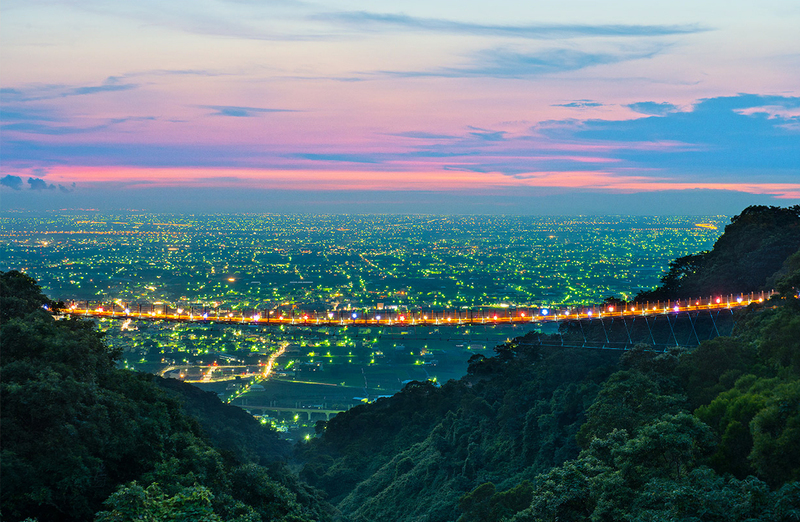 Big Buddha Parkland is located in Baguashan (Mt. Bagua) in Changhua. It is tight to Changhua downtown. 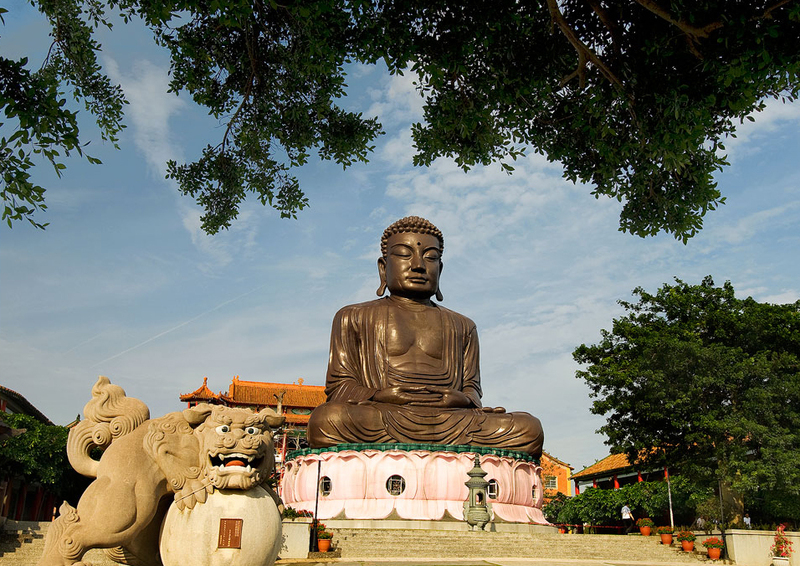 Black body Sakya Big Buddha statue is the special landmark and spiritual representation of Changhua City. From Baguashan (Mt. Bagua) going through the Big Buddha archway, walking along till the end of the way, there is Big Buddha sitting up straight in the wide place. Baguashan (Mt. Bagua) Big Buddha is built in 1961. The whole body is curved with the ferroconcrete sculpture. From the lotus seat to the Buddha’s whole body, the length is about 7.2 foot; the shoulder length is about 13 foot, and the length of the across chest is 44 foot. It was called the biggest Buddha in Asia in early years. 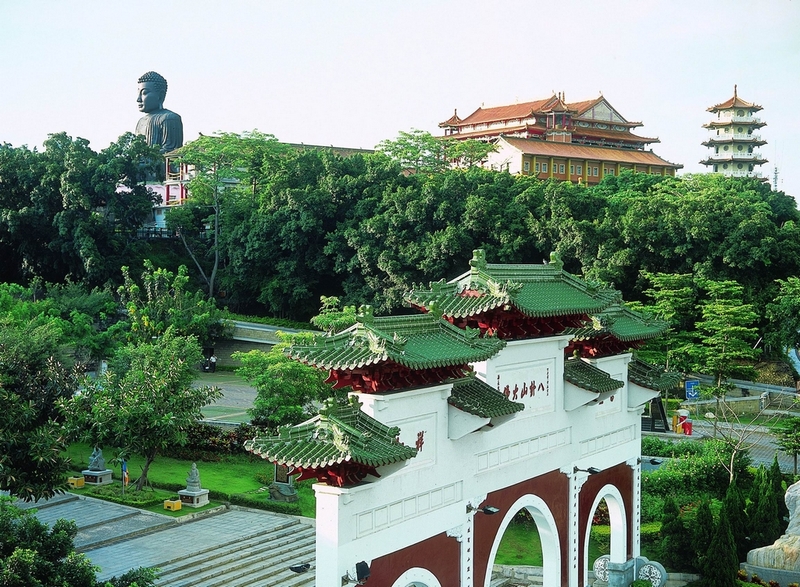 Big Buddha is not only to supply visitors to join visiting, but also an important athletic place for the people in Changhua at usual. The aroma joining the Buddha footway of green view, it is a beautiful place that you can imagine. And the Long Pond rebuilds in front the big statue of Buddha. It is classic and beautiful especially overlook the streets of Changhua City at the corridor in front of the pond. There is a water dancing show in Long Pond at night. It provides a great new view for the visitors. There are six sections divided in the inner part of the statue. The lowest part is the Buddhist sanctuary. The second to the fifth floor are all about Buddha lifetime marks. Gradually step up the stairs; right against to your face is the 32 Buddhist contributions contributed by the believers at two sides of corridor. It was named numerous statues. Every floors design exhibits the lifetime of the Big Buddha. This is the place that Changhua County Government and the local scholar desiring established a temple with the Changhua County’s landmark and the representation of the spirit. Furthermore can supply the dwellers the psychical hopes, and also bring up the movement of the local tour development. 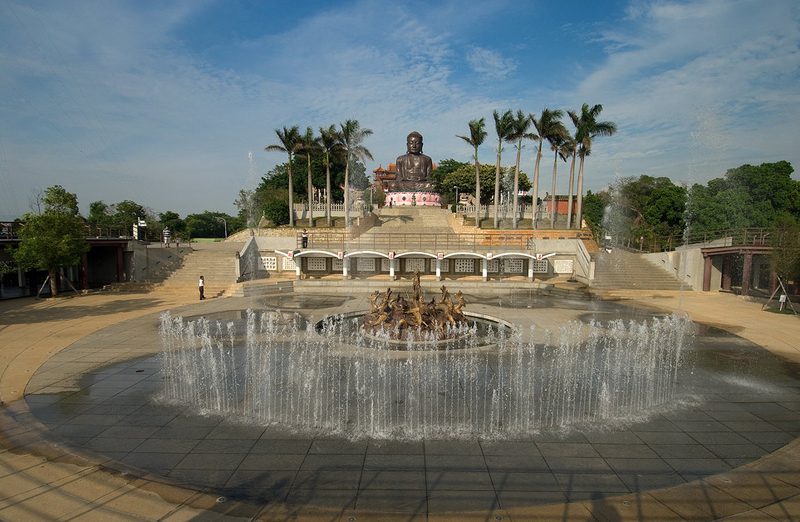 Because the government of Changhua County is trying to rebuild the whole area, there are combination of Buddhist footway, delicately pleasance area, clocking geyser fair show area, tour service center, restaurants, souvenir monopoly shop, multimedia audio-visual room, community culture exhibition and showing room and so on, providing the visitors more abundance service. Around the Big Buddha visiting area, there is a man-size static park layout. The finishing re-build part also includes natural biome garden area, athletic garden area, and visitor service center. All these make the Parkland more diversifying. Close to the Tri-Mountain Buddha Landscape, the Baguashan Ecological Visitor Center was opened on March 17, 2001. Around the spring equinox in March each year, the center highlights the Grey-Faced Buzzards that fly back north or make a foraging stop in the Baguashan area. 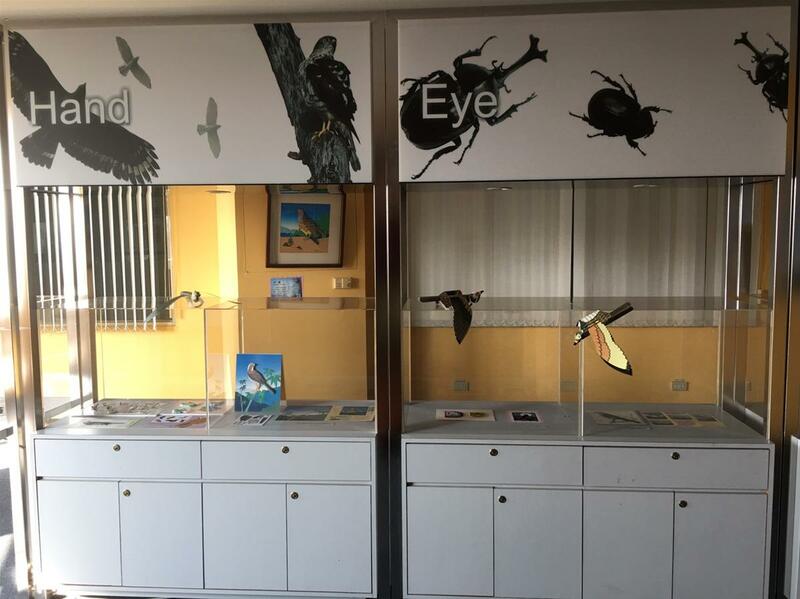 The Center also offers information on wildlife and plant life in the area. 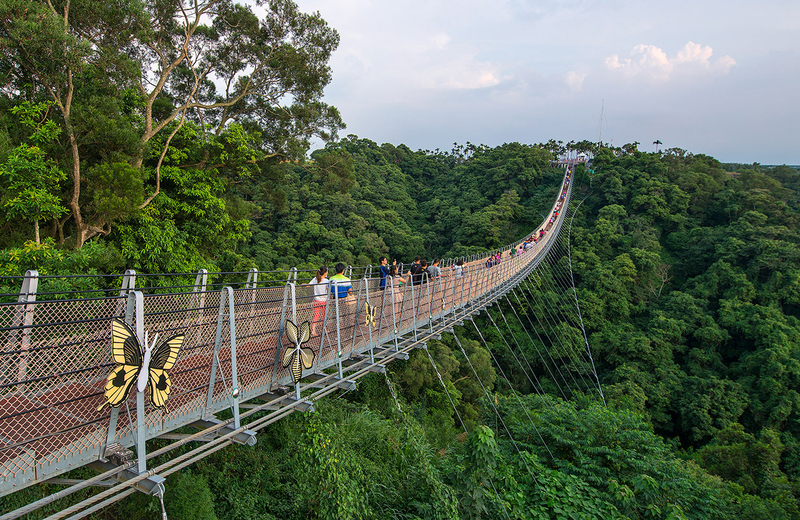 It houses the country’s first Grey-Faced Buzzard Theme Pavillion, which displays a collection of ecological records of these fascinating birds. The grey-faced buzzard is a strong bird of prey living at the top of the food chain. 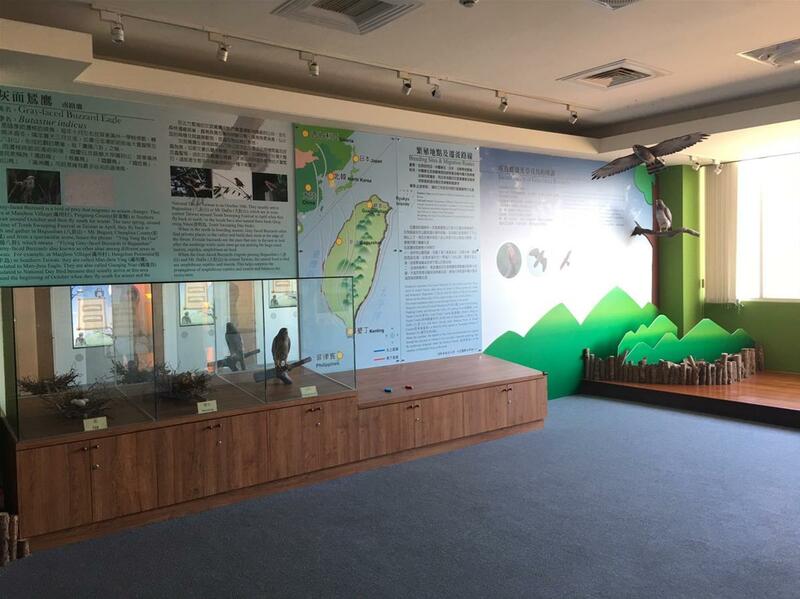 Every spring, when the weather up north turns gentle again, around the time of the spring equinox or Tomb Sweeping Festival (Qingming Festival, early April), the Grey-Faced Buzzards will fly north back to their breeding grounds. They pass by Baguashan Scenic Area, the Dadu Mountains, and other environs and may take a rest there. This has given rise to the bird’s popular names, such as Southern Eagle, Qingming Bird, and Tomb Sweeping Bird. When towards winter the weather turns cold again, the grey-faced buzzards will start flying south once more around Taiwan’s National Day (October 10), and they will pass by Manzhou Township of Kenting City in the very south of Taiwan, which has given rise to the names National Day Bird and Manzhou Bird. The Centre’s façade features a relief of grey-faced buzzards created by local artist Wang Chen Wen. The enlarged sculptures of the grey-faced buzzards invite visitors into the Grey-Faced Buzzard Theme Pavilion and make people aware that the theme is the Grey-Faced Buzzard. This is also a popular spot for young and old to take pictures for their Facebook pages. Nat'l Hwy 1 → Exit at the Changhua Interchange → Zhonghua W. Rd. → Zhonghua Rd. → Kongmen Rd. → Dongmin St. → Guashan Rd. Take HSR to Taichung Train Station, transfer to Lukang Route Shuttle Bus 6936(Low), get off at Cultural Affairs Bureau (Mt. Bagua Great Buddha Scenic Area) stop. Please see bus schedule on Taiwan Tourist Shuttle Bus Web.